Can a fence be installed with snow on the ground? Call Pet Stop of Traverse City for details. High grade, superior quality products made with your pet’s health and comfort in mind. All of our products are AMERICAN MADE and manufactured in Morgantown, PA.
Pet Stop of Traverse City we are your local electric pet fencing experts and offer reliable, unsurpassed quality pet fencing installations and products to Traverse City, MI and the surrounding area. 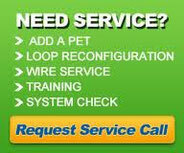 (See our List) We've been installing and servicing underground electronic pet fence systems throughout N.W. Lower Michigan since 2003 - with our professional skills and expertise, combined with Pet Stop's highly customizable and advanced products, keeping dogs and cats safe in their yards is what we do best! If you live in N.W.Lower Michigan and you need a dog or cat fence, give Pet Stop of Traverse City a call! You can rest assured that your pet is in the best of hands with Pet Stop of Traversye City we're dedicated to bringing you the very best in customizable electric pet containment. We provide reliable, top-of-the-line pet fencing systems that we'll personally tailor to fit the needs of any breed or yard type - GUARANTEED! The Most Humane, Most Technologically-Advanced Electric Dog Fence Systems Available, Period. "If you can find a more advance pet containment system than Pet Stop, we will buy it for you"
Pet Stop® is the only 100% USA pet fence manufacturer - all of our products are 100% designed, tested, and manufactured right here in the USA. They employ some of the most experienced leaders in the pet fence industry, including many former Invisible Fence® employees and the founder of Invisible Fence®, John Purtell! 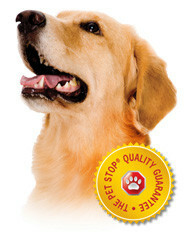 Pet Stop® has an outstanding reputation for making highly reliable hidden electronic pet fence products that incorporate cutting edge technology. As your local pet containment experts, Pet Stop of Traverse City feels confident that Pet Stop® is the right product for a permanent pet solution. Contact us today to find out how Pet Stop of Traverse City and Pet Stop® can help you keep your pet safe, happy & healthy. If you're an Invisible Fence® owner and you have a wire break or some other maintenance problem, you're in luck! Though Pet Stop of Traverse City is not associated with Invisible Fence® or any other electric pet fencing brand, we do provide independent service on all other brands of pet containment including Invisible Fence® , PetSafe®, Radio Fence®, Dog Guard®, Underground Pet Fencing Co, Innotek®, Smart Dog® Dog Watch®, Pet Guardian® and others. We also provide product upgrades, exchanges, trade-ins and replacements.